Robinia pseudoacacia is a tree to 25 m tall; 50 cm dbh at about 40 years. Mature bark gray with deep, sinuous grooves. Trunk divides about 5 m up. Roots shallow, wide spreading. Colonial from root sprouts (Hardt & Forman 1989). Very fast growing with high nutrient uptake (Boring and Swank 1984). Roots associated with nitrogen fixing bacteria (Rhizobium sp. ), growing roots probably allelopathic. Spines 1 cm long at often paired at nodes (stipules modified into spines), especially on young trees or root sprouts; winter buds hidden by leaf scar, which often has three irregular fissures and three vein scars (Harlow 1946; Petrides 1988). 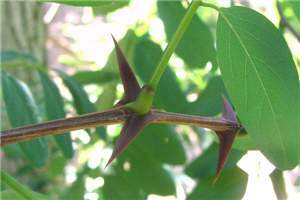 Leaves alternate, pinnately compound, with 7-19 leaflets, leaflets elliptic, to 4 cm long, blunt at both ends, dull light green, margin smooth; leaflets expand mid-May; winter plant leafless 174 days (Britton 1874). Flowers white, irregular, (pea flower-shaped), fragrant, in drooping racemes, May-June; pollinated by bees. 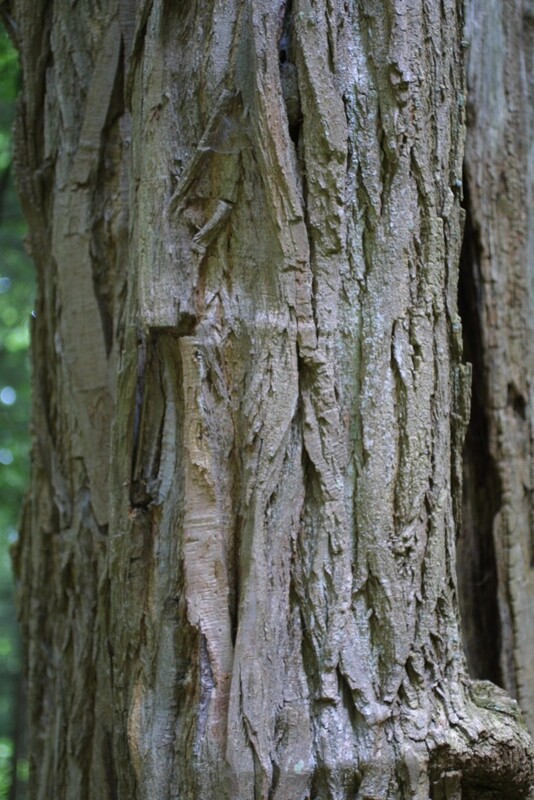 Robinia pseudoacacia.mature bark.www.discoverlife.org. (Accessed 9/2014). Fruit dry, pods flattened, thin-walled, about 7cm long, 4-10 hard, dark brown seeds, about 0.5 cm long, Sept.-Oct.; pods open on tree, seeds dispersed through winter. Seeds eaten by squirrels and quail, bees use nectar to make honey. Seeds probably dispersed through burial by squirrels and other small mammals (E. Stiles personal communication). Origin: Native west of NYC (PA and south through Appalachians). Habitat: Pioneer in disturbed areas, roadsides, moist, well drained fill, limestone soil (Young 1996). In NYC, found on soils of pH 4.3-7.0 (Gargiullo, unpublished data), 4.6-8.2 (USDA, NRCS 2010). Does well on sterile sand to concrete rubble, demolition debris, colonizes open areas, resprouts after cutting or fire. Tolerant of salt and ozone. Very intolerant of shade, dense herbaceous cover can prevent establishment of seedlings. 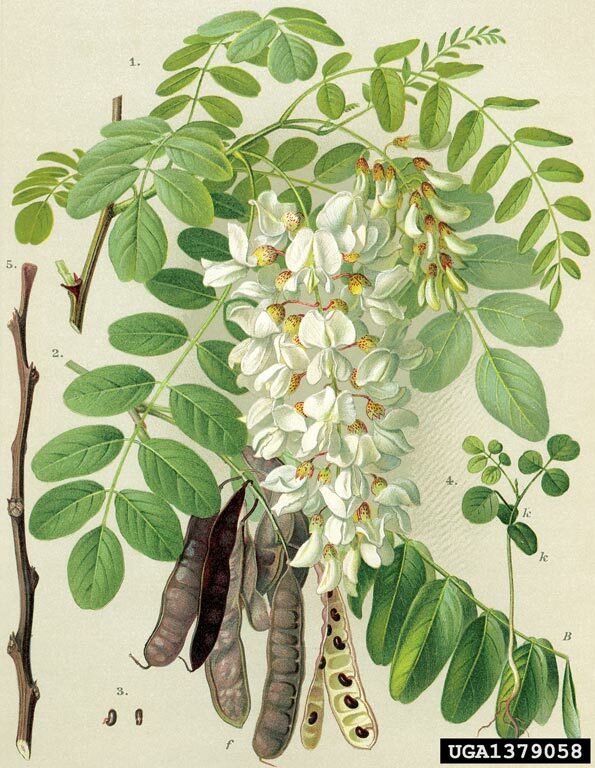 Robinia pseudoacacia.Sheldon Navie.keyserver.lucidcentral.org. (Accessed 9/2014). Notes: Trees with heart rot used by woodpeckers for nest cavities. Wood is very hard but weakened trees are attacked by a large bracket fungus (Phellinus robiniae), Coral spot canker (Nectria cinnabarina), heart rot fungi (Polyporus robiniophilus) and other fungi (Wayne et al.1987). Also attacked by locust borer (Megcallene robiniae) and locust leafminer (Odontota dorsalis), which defoliates trees almost every year (Burns and Honkala 1990; Sinclair et al. 1987). Listed as one of the “top twenty” invasive alien plants by the NYS Natural Heritage Program’s Ad hoc committee on invasive plants, but continues to be grown by NYS Nursery.